Google announced new updates for accessing AdWords accounts. Users now can use one email address to log in to multiple accounts, quickly switch between accounts, and invite new users. 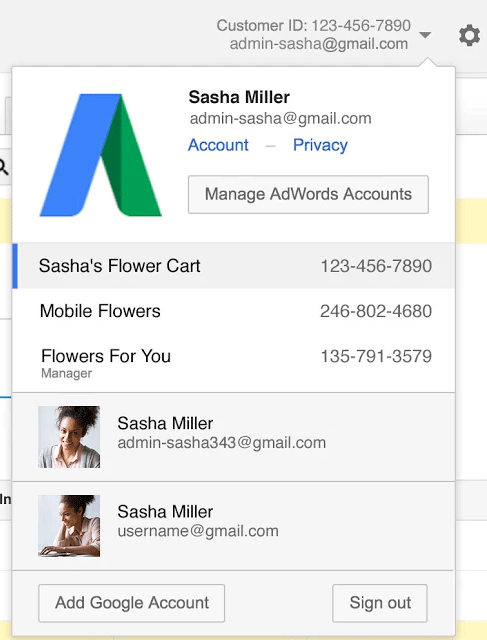 Users can connect up to five AdWords accounts to one email. The option to add additional accounts can be accessed through the ‘Manage AdWords accounts’ screen in the main menu. Adding users to an AdWords account has become easier by avoiding the email verification step. Now, when a user is added to an account, they can start accessing it right away. (1) Click your email address or customer ID on the top right. (2) Click Manage AdWords accounts from the drop-down menu. (3) You’ll see a list of the AdWords accounts associated with your current Google Account.